Order by April 19 to ensure you receive Awareness gear in time. Your purchase helps us continue our mission to improve the quality of life for those affected by asthma, allergies and food allergies. When you buy awareness items you also benefit other families who are managing food allergies. All of this is part of our mission. We are dedicated to improving the day-to-day lives of families raising children with food allergies and empower them to create a safe and healthy future for their children. Your gift can save lives. When you purchase gifts from our online store, the proceeds help us continue to educate, advocate and support research that allows those with food allergies to have better health and quality of life. 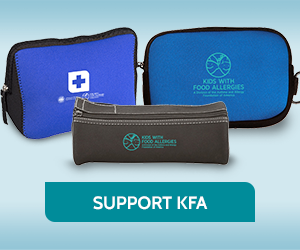 There is no cure for food allergies, but KFA provides the practical support that gets families through each day.